The following stocks contain transgenes carrying three tandem copies of the histone gene cluster (His1, His2A, His2B, His3 and His4) with modifications made to particular histone genes. To replace normal histones with histones encoded by these transgenes, the transgenes may be crossed into a background where the histone cluster has been deleted by Df(2L)His[C] or Df(2L)BSC104 (stock 8670). 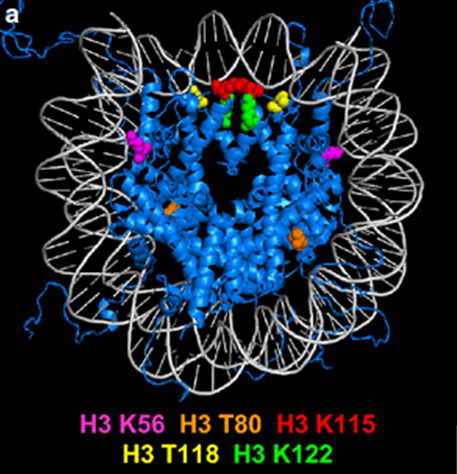 These stocks were described in Graves et al., (2016) "Mutations that prevent or mimic persistent post‑translational modifications of the histone H3 globular domain cause lethality and growth defects in Drosophila". Epigenetics & Chromatin 9:9.